The Girl Who Takes An Eye for An Eye by David Lagercrantz is the latest novel in the Millennium series. Being the fifth novel in the Millennium series that began with The Girl with the Dragon Tattoo by Stieg Larsson, this book is one of the most awaited novels of the year. NY Times Bestselling author, David Lagercrantz, has written The Girl who takes An Eye for An Eye. He also wrote the previous novel of this series. The book is set to release in September 2017. The much-loved protagonist, Lisbeth Salander, is back in the new novel of Millennium series. Lisbeth is the girl having a dragon tattoo, an intelligent hacker, a girl determined for justice for herself and others. In this upcoming novel, The Girl Who Takes An Eye for An Eye, Lisbeth has a chance to uncover all the secrets from her childhood that have been haunting her for long. And, she won’t let it go. Mikael Blomkvist, the editor of the investigative journal Millennium, comes along when Lisbeth seeks his help. The story of The Girl who takes An Eye for An Eye has all the thrill with exhilarating ups and downs that the due faces. Be it the Anti-Muslim gang whom she enrages to rescue a young lady; or the Russian mafia. The plot of The Girl Who takes An Eye for An Eye introduces also Lisbeth’s long-lost twin sister Camilla. Among everything, there is a sinister pseudoscientific experiment that can become an insidious problem on the face of mankind. With all the things against her, Lisbeth and Mikael takes on everything in this exceptionally thrilling installment of Millennium series. 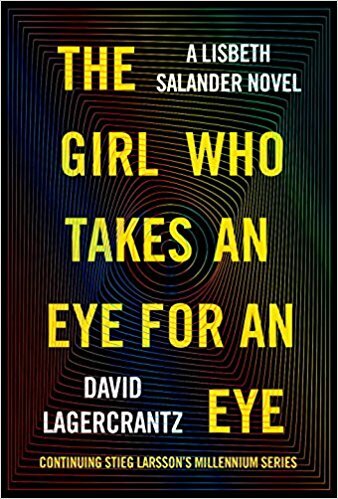 This is a pre-release review of The Girl Who takes An Eye for An Eye by David Lagercrantz which will be updated after the release of the book. The release date of The Girl Who takes An Eye for An Eye is 12 Sep 2017. Born in 1962, David Lagercrantz was is an acclaimed author and journalist. He has written numerous biographies including the internationally best-selling I Am Zlatan Ibrahimović, for which he was the ghostwriter. David has also written four fiction novels, including Fall of Man in Wilmslow and the #1 best-selling The Girl in the Spider’s Web. Vowelor is the best community for book lovers, authors, and bloggers. Find out the latest books, new book releases, reviews, author interviews & much more.